Newly renovated heritage log cabins made entirely of logs, inside and out. 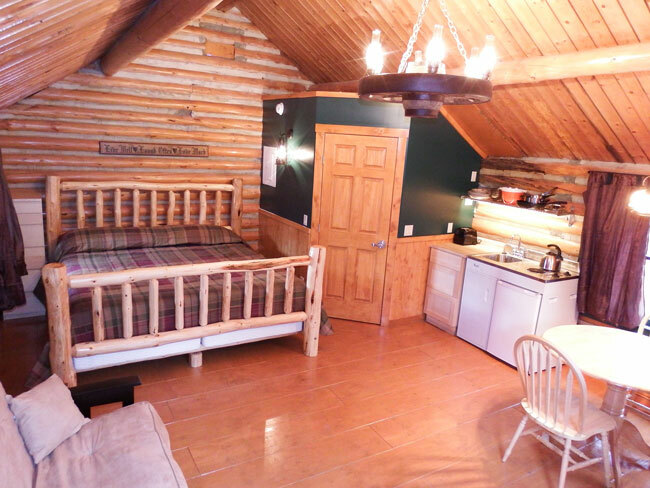 Each log cabin has a King sized bed plus a futon. Cots are also available. Cots must be reserved in advance as we have a limited number available. Kitchenette contains a stove top, sink, microwave, fridge, dishes, and utensils. Each log cabin also includes a 3 piece bathroom. The Jasper Gates Resort and RV cabins were built in 1946 by outfitter Frank Wells, a retired Jasper Park Warden, and his son Ralph for their tourism business at Athabasca falls. The logs for the cabins, office, and living quarters were cut from near Whirlpool River, loaded onto a sleigh and hauled about seven miles to the falls. The Federal Government bought the tourism business in 1961 and removed all traces of it. The cabins were moved to the Overlander Resort and then down the road to their current location at Jasper Gates Resort in the late 1960s. As an interesting side note, Geraldine Lakes and Geraldine Mountain (now Whirlpool Mountain) were named after Frank Well’s daughter, Geraldine. The design of the cabins, with their gable fronts, saddle log corner notching, exposed peeled log walls, roof beams, and plank flooring display the cabins’ solid craftsmanship designed to withstand the test of time. The three casement, double hung sash, four over one window panes and plain wood frames and sills are original to the design as well.